On this Memorial Day, we remember the men (and women) who died serving our country and protecting our freedom. 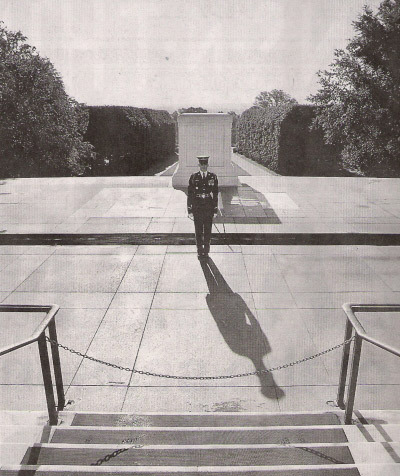 * USA Today photographer H. Darr Beiser’s photos and brief essay, “In Honor of the Unknowns: An Iraq War Veteran Stands Guard at Arlington,” which details the U.S. Army’s Sgt. Chris Moore (of the Third Infantry Regiment) and his current duty at the Tomb of the Unknown Soldier at Arlington National Cemetery. It comes with a an excellent presentation/slide show featuring the voice of Sgt. Moore. One evening, a casualty officer and I drove down the road on our way to inform a soldier’s spouse that her husband had died in Iraq. As an Army chaplain, I thought about how difficult it would be for this young mother and how empty the two children’s’ lives would be without their dad. On our way to the house, the casualty officer had assured me that he would be able to deliver the sad news. But when we got to our destination, his confidence disappeared. “Chaplain,” he asked, “will you pray for me?” I placed my hand on his shoulder and began to pray. I asked God to give us the strength to perform our duty. I asked God to control our thoughts and actions and comfort the household we were about to enter. When I finished, we got out of the car and with great pain did the job that we were both called to do. Memorial Day reminds us of the soldiers who gave their lives for our country. But often we forget to also honor the families they left behind. . . . There was a time when I considered leaving the ministry. Then a friend asked me to join the military chaplaincy. It changed my life. The past year, I served as chaplain for a 600-soldier logistics battalion in Baghdad. Whoever said that “there are no atheists in the foxhole” was absolutely right. These soldiers had to deliver supplies along the most dangerous routes in Iraq. When bombs exploded, reality of war forced many to do some serious soul searching. Countless soldiers came to talk to me about war, death and faith. They presented me with many perplexing theological questions: Is God on our side, and will he protect me from death? Will God forgive me if I kill an innocent person by mistake? Will God be angry with me for participating in this war? Exactly where do we really go when we die? . . . This year, as we celebrate Memorial Day, we should pause as a nation from talk about high gas prices, what language our national anthem should be sung in and the latest celebrity gossip, and instead think about the men and women who continue to fight and die in places such as Iraq and Afghanistan. It is true: War is hell, freedom is expensive, death is painful and faith still matters – especially to those in the foxhole. Remembering those who died protecting America and our freedom. God bless America, those who served, and those who serve today. Sorry, you’re wrong, Chaplain. I wonder how he’d feel if somebody said “there are no blacks in foxholes”?